March in the Peloppones : Golf, Painting, Food and Friends! Each year we are fortunate to travel overseas for a great golfing week with some wonderful friends. Over the years we have golfed in South Africa, San Diego, Mauritius, France, New Zeeland and Portugal, and every time we have great fun. This year was no exception and our golfing group met at the Costa Navarino Resort in the Peloponnese region of Messenia in Greece. Ian Goldleman who runs Pro Golfing Tours ( www.progolfingtours.com ) creates our trips which include excellent tuition and lots of golf. The weather this year was a little mixed but we all had great time. Many thanks to Ian for organising everything and Bruce Framer who came along to help us with our golf tuition. Sadly Lynnette Brooky could not be along this year but we look forward to seeing her another time. I won’t bore you all with the golf outcomes as this is a travel and painting blog after all, however the resort was very nice in a lovely area of Greece. Located near Pylos in the south western end of the Peloppones, it is about 4 hours drive from Athens, and about an hour from Kalamata. We managed some sightseeing and visits to some ancient monuments in the area too, principally Olympia, Methoni and Messene. Olympia was very atmospheric and really enhanced by the lovely wild spring flowers. There are also some very good restaurants around the area and two were really outstanding. In Pylos there is the Taverna O’Koukos, and in Gialova, La Cucina Italiana. Two quite different restaurants but both really very good! O’Koukos was absolutely splendid and the food prepared and organised by Kosta and his mother Maria was delicious, and served by the terrific Roland! If you are ever in this area do go along there as it is such a treat! 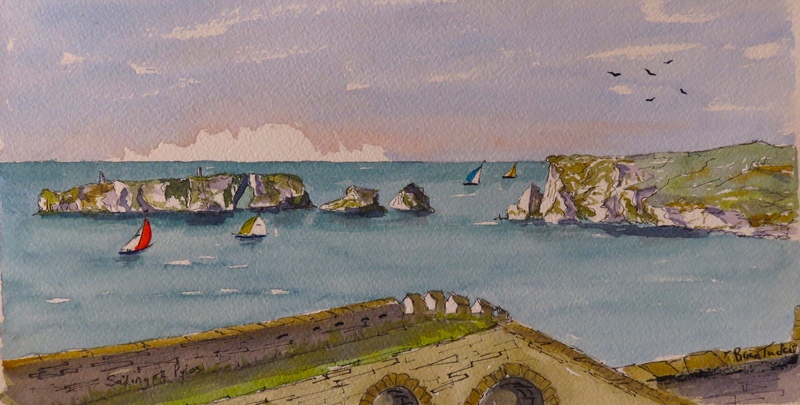 Like all our holidays I took the opportunity to take along the watercolours and managed to complete some pictures, which I am delighted to say our group have now taken home with them! However I always keep a photo record so here are some of my weeks watercolours. Nearby to Navarino Bay is the extraordinary beach at Voidokilia, here painted from an aerial photo and below from photos taken by me on the beach itself. It is an amazing sight and the clear waters are popular in the summer. No swimming in March though! South of Pylos there is the quet little town of Methoni. Once an important Venetian port and the scene of many battles. Methoni Castle is vast and at the seaward end has small castle on an island, which can easily be visited. From there the view across to the island of Sapientza gave me a nice back drop for the painting. 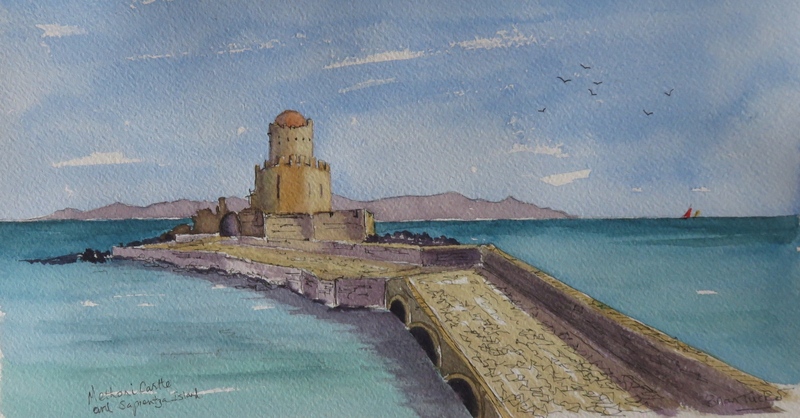 Part of the Venetian Fortress at Methoni. Navaroni Bay is protected by the Island of Sphacteria and a string of smaller islands. 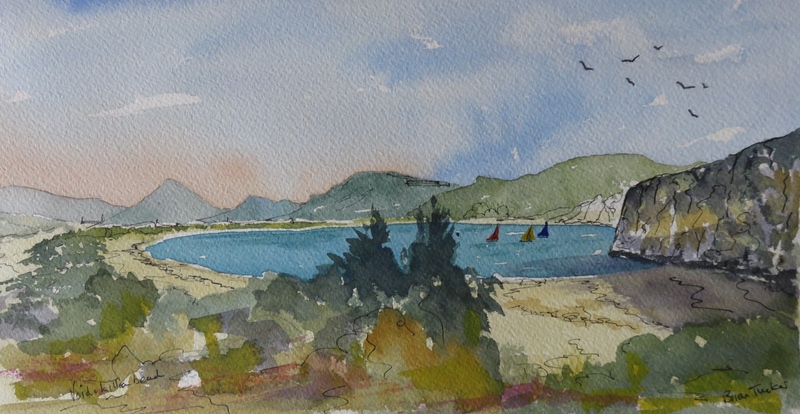 They can be seen from all over the area but the view from Pylos castle is the one I have used here for this painting. In the summer I believe there are boat trips from the harbour to the islands which I am sure would be great. 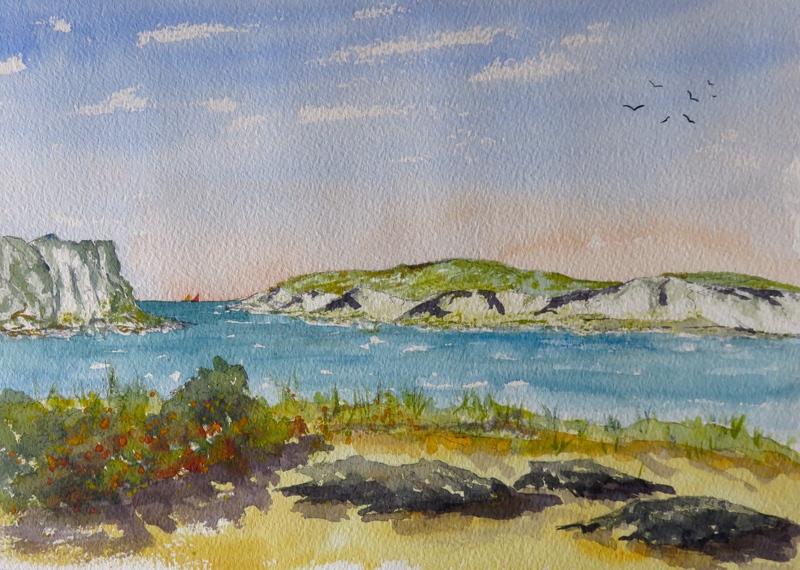 The islands off the coast at Pylos. Pylos is a very nice little town with a bustling central square and many restaurants. However do not miss going to O’Koukos restaurant at the northern approach to the centre of the town. Of course our main aim of being at Navarino Bay was to play golf. The Bay Golf Course has many great views of the area and below is just one . 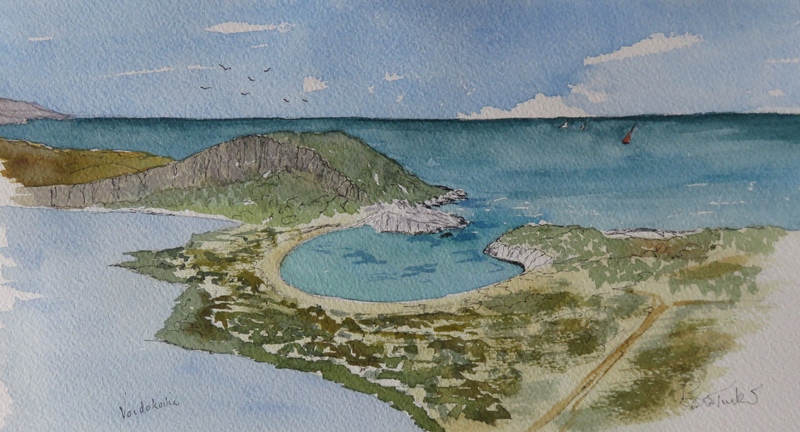 Again the islands and Pylos are in the painting but this time from the fairway of the 2nd hole on the Bay Course. I have come back with so many more photos that I hope to paint of this lovely and interesting area of Greece but they will have to be for another post. I hope you enjoy this one and if you have been or plan to be in this area maybe they will serve as reminder of the lovely area and it’s very friendly people.